CHINSEN MARU (B)- Chinsen Maru (or really Shohan Maru) is a Japanese Freighter that sits at 30 foot of depth in the lagoon. The ship has been in the water for over 50 years, allowing for some significant coral growth as well as becoming a home to thousands of fish. 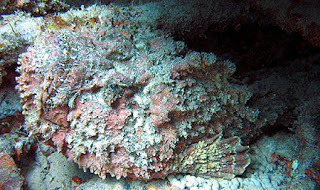 The wreck is probably the best place on island to find Stonefish (not to be confused with scorpionfish), several Stonefish call Chinsen home. Watch where you put your hands, they are amazingly cryptic. There are monstrous Red Snappers as well as Big Eye Emperors patrolling the wreck while huge schools of Goat Fish sit on top. To top it all off a resident White Tip rests underneath the wreck. Visibility: Ranges from 150 ft on a good day to 50 ft on a crummy day. When the viz in bad it gives the wreck this eerie look making for still a really good dive. Current: Ranges from none to moderate. * If you are lucky you might even have an encounter with the yellow submarine. My favorite dive, Richard. It constantly amazes me to find new things ther after many dives. I go often.